The history of Valentine's Day is obscure, and further clouded by various fanciful legends. The holiday's roots are in the ancient Roman festival of Lupercalia, a fertility celebration commemorated annually on February 15. 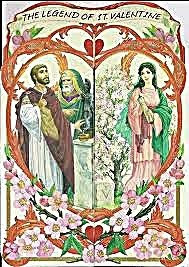 Pope Gelasius I recast this pagan festival as a Christian feast day circa 496, declaring February 14 to be St. Valentine's Day. 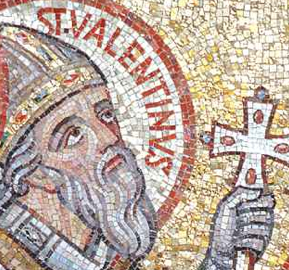 Which St. Valentine this early pope intended to honor remains a mystery: according to the Catholic Encyclopedia, there were at least three early Christian saints by that name. One was a priest in Rome, another a bishop in Terni, and of a third St. Valentine almost nothing is known except that he met his end in Africa. Rather astonishingly, all three Valentines were said to have been martyred on Feb. 14. Most scholars believe that the St. Valentine of the holiday was a priest who attracted the disfavor of Roman emperor Claudius II around 270. At this stage, the factual ends and the mythic begins. According to one legend, Claudius II had prohibited marriage for young men, claiming that bachelors made better soldiers. Valentine continued to secretly perform marriage ceremonies but was eventually apprehended by the Romans and put to death. Another legend has it that Valentine, imprisoned by Claudius, fell in love with the daughter of his jailer. Before he was executed, he allegedly sent her a letter signed "from your Valentine." Probably the most plausible story surrounding St. Valentine is one not focused on Eros (passionate love) but on agape (Christian love): he was martyred for refusing to renounce his religion. In 1969, the Catholic Church revised its liturgical calendar, removing the feast days of saints whose historical origins were questionable. St. Valentine was one of the casualties. It was not until the 14th century that this Christian feast day became definitively associated with love. According to UCLA medieval scholar Henry Ansgar Kelly, author of Chaucer and the Cult of Saint Valentine, it was Chaucer who first linked St. Valentine's Day with romance. When every fowl cometh there to choose his mate. Over the centuries, the holiday evolved, and by the 18th century, gift-giving and exchanging handmade cards on Valentine's Day had become common in England. Hand-made valentine cards made of lace, ribbons, and featuring cupids and hearts eventually spread to the American colonies. The tradition of Valentine's cards did not become widespread in the United States, however, until the 1850s, when Esther A. Howland, a Mount Holyoke graduate and native of Worcester, Mass., began mass-producing them. Today, of course, the holiday has become a booming commercial success. According to the Greeting Card Association, 25% of all cards sent each year are valentines.